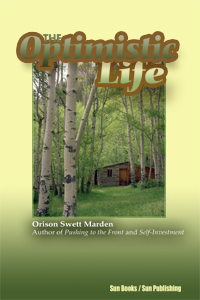 THE OPTIMISTIC LIFE by Orison Swett Marden. The Power of Amiability, The Inner Life as Related to Outward Beauty, The Value of Friends, The Cost of an Explosive Temper, Learn to Expect a Great Deal of Life, Mental Power, If You Can Talk Well, Brevity and Directness, What Distinguishes Work From Drudgery, Keeping Fit for Work, Mastering Moods, Business Integrity, Wresting Triumphant From Defeat, Freshness in Work, Don't Take Your Business Troubles Home, Let It Go, Etc! 316 pgs. 5x8. Paperback. ISBN: 0-89540-351-X. (ISBN: 978-0-89540-351-3). $28.00.